and enjoy coverage up to many miles of shore. The MultiRouter 3G/LTE Mini is MarPoint’s latest innovation for high speed internet at sea with extensive coverage up to 99%. Give managed internet access to your guests. GlobalSim Data only Roaming Card offers coverage in 64+ countries and unlimited Data packages. Connect external Wi-Fi Networks on Marinas, Hotel bays or anywhere External Wi-Fi is available for yacht. When connecting you can share the external Wi-Fi source through your internal Wi-Fi or LAN network for personal use. GlobalSim Data only Roaming Card offers coverage in 64+ countries and unlimited Data packages. MultiRouter software is maintained and developed exclusively by MarPoint, thus allowing expansion of the interface according to the customers’ needs. 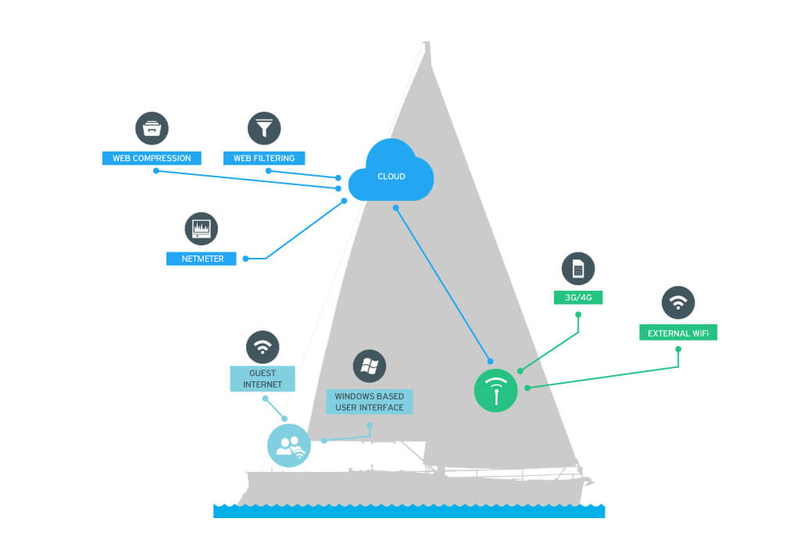 Connect external Wi-Fi Networks on Marinas, Hotel bays or anywhere External Wi-Fi is available for yacht. When connecting you can share the external Wi-Fi source through your internal Wi-Fi or LAN network for personal use. Our NetStats Reporting software allows for counting the data used per vessel and per getaway. The proxy service is provided as add on service to the EVO2 but can also be provided as SaaS “Software as a service. Webpage content filtering or web compression is provided as an add-on service to the EVO2 but can also be provided as SaaS “Software as a service.